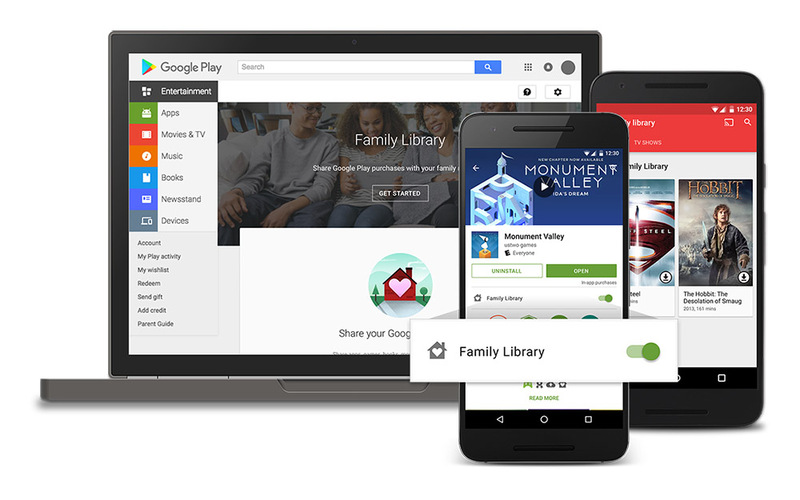 Today, Google is introducing the Google Play Family Library, giving families the opportunity to share purchases from Google Play across accounts, so that everyone always has access to movies, TV shows, apps, games, and books. The service or feature is free and will be available over the next few days in a variety of countries, including the US. So how does this work? As noted above, if opted-in, you will be able to share “eligible” apps, games, movies, TV shows, and books with up to six (6) family members. You’ll notice that music isn’t listed – more on that in a second. As you buy movies or games or other items, and you are a part of a family library, you will soon see the option to add those to the “Family Library” via toggle in listings. You can see how this will look in the image above. That also means that you don’t have to make everything available to all members of your family and can pick and choose what you think is acceptable for all to have access to. What about payments? When you sign-up and created a family, you’ll pick a family payment method that everyone can use to buy items. With that said, each member can use their own credit cards or gift cards as payment methods as well, plus you can force some members to need to approval from you before buying. On a related note, if you have family members with iOS devices, they will also have access to movies, TV shows, and books. OK, so back to music. Google Play Music is separate from this plan and still requires a subscription to the Google Play Music family plan if you want the unlimited playing and sharing of songs. It still costs $14.99, while the Family Library is free. Again, Google says that rollout of the Family Library will happen over the next few days and will be available in Australia, Brazil, Canada, France, Germany, Ireland, Italy, Japan, Mexico, New Zealand, the United Kingdom and the United States. To sign-up, head to this link.